So what is actually going wrong with Intel’s 10nm process? SemiAccurate has been researching that question for years and it is finally time for a comprehensive answer. We first noticed problems with Intel’s 14nm process when Broadwell mysteriously lost 200MHz from their GPU frequency and then Skylake didn’t claw it back. Those same problems were magnified on the 10nm process which resulted in, well, nothing released. Officially speaking the 10nm process ‘came out’ in 2017 and is shipping for revenue. SemiAccurate pointed out how this was nothing more than a PR stunt meant to influence the stock price, it simply wasn’t real. 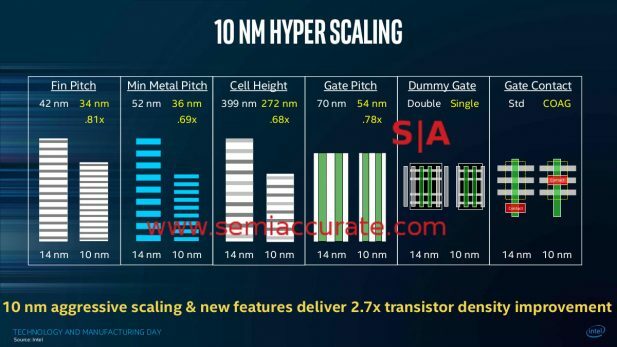 Intel promised 10nm in 2015 and when that didn’t occur they invented the term “hyperscaling” to make it seem like this delay was both expected and a good thing. They really didn’t seem to be expected and certainly weren’t a good thing. About a year later in their Q1/2018 earnings call, Intel partially admitted what SemiAccurate has been saying for over a year, 10nm is due in Q4/2019 best case. What Intel is not telling you, or the analysts, is that the 10nm you may get in late 2019 is not the 10nm they had intended to come out in 2015. More importantly this new process is a significant step backward from the 10nm they promised, as touted in their manufacturing day. How much of a step backwards? Several of SemiAccurate’s moles are saying it is effectively a 12nm process rather than a 10nm process, and the technical changes more than back that claim up. Don’t expect this to ever be publicly admitted to, it is still ’10nm’ and always will be even if the tech doesn’t back that name up. Worse yet those changes are going to entail a stunning cost in both dollars and engineering time. How Intel got into this position, why they took so many years to acknowledge the problem, and why they are still hiding the pertinent facts are questions we can’t answer. What they are doing to fix it and the costs are something we can talk about. In detail. The short version is that there are multiple problems with Intel’s 10nm process, any of which would be enough to potentially sink the node. Depending on how you look at things there are either four or five distinct problems of a technical nature and several more on the management side. Some of the technical issues are definitely changing to fix the process, some are a little less definite with SemiAccurate’s moles giving conflicting information there. In any case the 10nm parts that may come out in late 2019 are much more akin to 12nm parts. How bad is the current 10nm process? To put it mildly it is unworkable on both technical and financial fronts. Initial yields on Cannon Lake which SemiAccurat first reported as, “awful” were in the 8-10% range. Contrast this with their expected range of 50-60% yields on a new process and you have a pretty dire situation. Since then things have improved but not much, think increments not multiples, and multiples are needed. What exactly is going wrong? According to our sources Intel doesn’t actually know, they know what the problems are, but not why things are going off the rails.